For more information please read the included #readme.txt. Forget Splatoon! 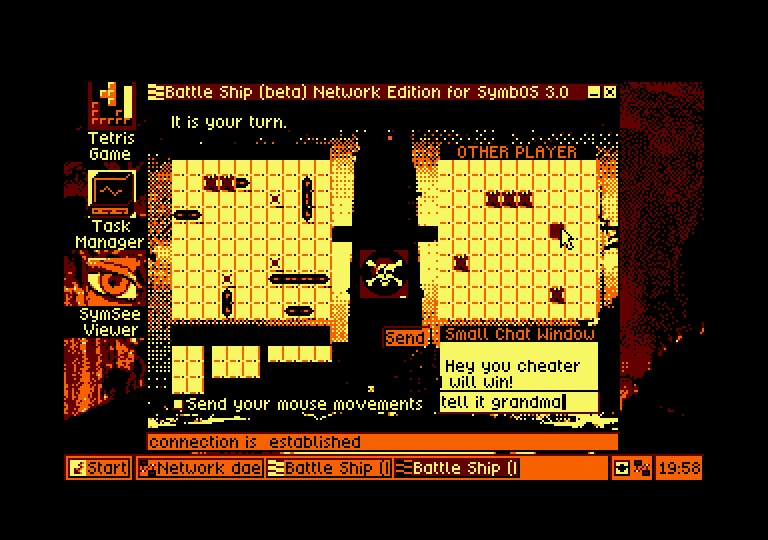 Now I want to upgrade my CPC & play Battleships online. It genuinely looks like it would be great fun with the messaging window open for real time discussion. You can't chat in Splatoon anyway! These are good news! Congratulations! @Prodatron: This is release 3.0. beta. You are almost reaching version 3.1., which should be the first to hit the masses on the market (as it did for Windows ). And you almost have 3.11 for work groups . Which hardware do you use for network access? Where can it be bought? Looking forward to try it when I have some time.... Congrats to this milestone! I plan on upgrading my main symbos setup to v3 tonight. Bring on the Ethernet card, either standalone or minibooster add-on. This 2 months i'll be very busy and far of my cpc, and waiting for Justcpc too. When i have time and justcpc, i'll try symbos 3.0 and unify of course! Did you get it working? Which network hardware did you use? I guess Prodatron could have skipped the CPC version since 99% of normal users on here know there is no hardware as yet. But consider this as motivation for hardware and emulator creators. Thanks for the hint, indeed SymAmp wasn't included. I added the preview with PlayCity support to the package, just download it again under the same link. This is still a preview, as the normal player for the internal PSG isn't included, so it's better to keep both versions. since 99% of normal users on here know there is no hardware as yet. But consider this as motivation for hardware and emulator creators. This is exactly the intention of this release. 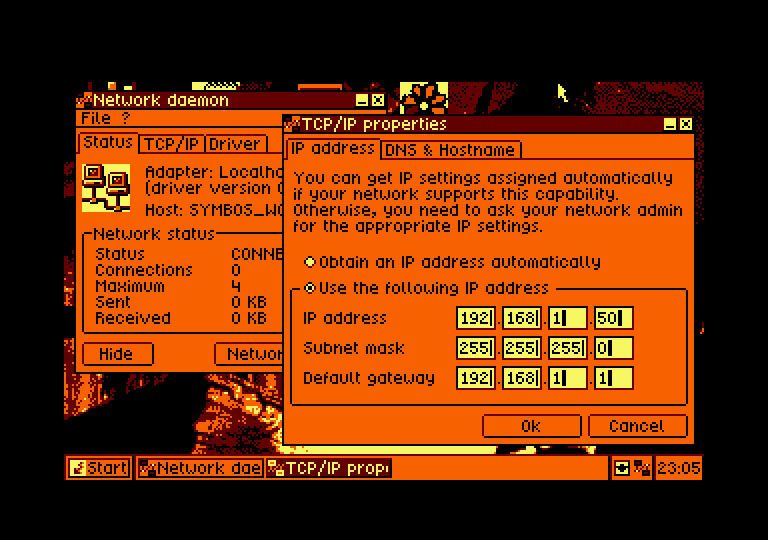 And with the localhost network daemon you are already able to try out all included network applications on your real or emulated CPC. This version of the network daemon contains the localhost driver. 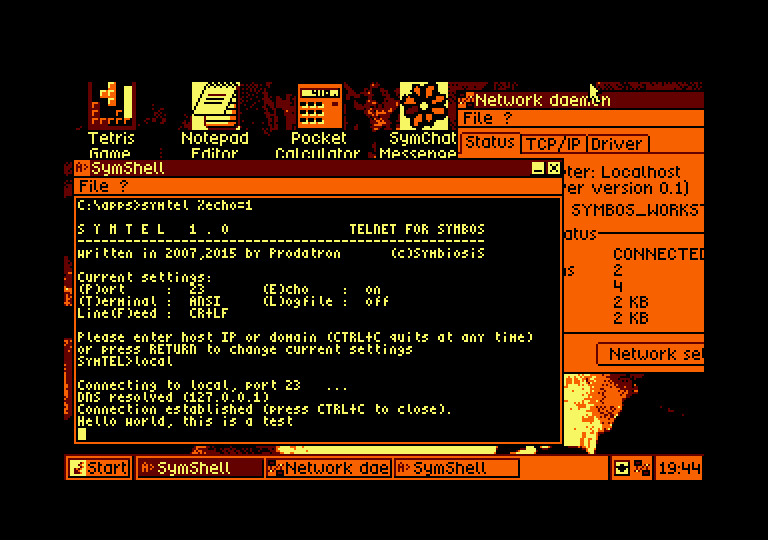 It is platform independant and can be used on every supported SymbOS Z80 platform. It enables a "local" network on your own machine. Now you can start server and client apps which are then able to communicate with each other within the SymbOS environment. It is not necessary to do any configuration for the localhost driver, all IP addresses and domain lookups are always 127.0.0.1 based. The localhost version of the network daemon is very useful for testing network applications with an emulator and to have all available network applications already running on computers without ethernet hardware. So I though there is already hardware for the CPC. Guess 99% assumed like me. Feels very stupid to repeat it again and again, but yes, since march/april there is a new minibooster based hardware which enables ethernet access for the CPC. SymbOS network support development Already forgot about these photos? If you can tell me where to get one I'll order one today. Just checked @TotO's store, no not there, not even on the minibooster page. So please tell me where I can get one. There is no available hardware as yet. If there was I think it would be all over the wiki. TFM also knows this since the thread he points too the very next message is from Kaos saying the hardware doesnt work... And TFM liked that??? I think it was made quite clear that this 3.0 beta contains a driver for the MSX network cards, and otherwise Localhost, plus a lot of accompanying software. It will only ever be of true value to somebody that has a CPC network card or when an emulator supports a CPC network card. You can try things in a limited was using localhost, or even get yourself an MSX2. I hope that there is a network adapter soon for the CPC! as then we can connect different z80 systems using ethernet and SymbOS togetther!! That would be so cool! The cool part is that the localhost driver is already working in SymbOS so all the network stuff is already in there! I'm the lucky one that have a network adapter for my MSX so i played with it and i can only say that it is so cool that you can do this with your old machine! I'm so glad that Trebmint and Prodatron did all this work! Al this seems so normal but it must take a lot of work and time to make this! Thanks for all this work! I'm very happy that this OS was ported for different z80 system and that there is one OS that works for all! Crazy not!? I know it's not available, I'd have one if it were, unfortunately @Prodatron 's post stated it is available since April. There is a working hardware since april, but no-one ever said, that you can already buy it, or did I? - Trebmint, EdoZ and me are only doing the software; we have neither the knowledge nor any influence for the hardware development at all - I think this is also quite clear, isn't it? This all has already posted before, but maybe it's good to make a summary again. i'm waiting some AVR Atmega168 modules to make an I/O to SPI adapter for Wiznet modules. It's a bit dirty, because SPI will make some lag, but I/O (indirect) mode is a little buggy when managed from a Z80 and memory (direct) mode is a little conflict with memory expansions. Well , SPI mode will enable the use of other SPI-only Wiznet modules, cheaper than the memory-IO-SPI module i'm using. Just thinking... If I use the original PCW serial+centronic printer adapter with an 8266 serial to wifi, I can have TCP/IP conectivity at the PCW? Page created in 0.282 seconds with 104 queries.